I watched the movie 'Soylent Green' last Sunday night on Amazon. When I was a kid, I thought it was the coolest movie ever. This movie ranked up there with 'Westworld', 'Logan's Run', 'Omega Man', 'Planet of the Apes' and 'Silent Running' as my favorites of the pre-Star Wars era. I especially loved the detailed illustration on the movie posters - riot police with trucks scooping up people and putting them in the back of trucks to be carted off to who knows where. Soylent Green was filmed in 1973 and set in the year 2022. There are 40 million people in New York. The greenhouse effect' makes it hot all year round and the only food is rations of processed colored soy crackers. 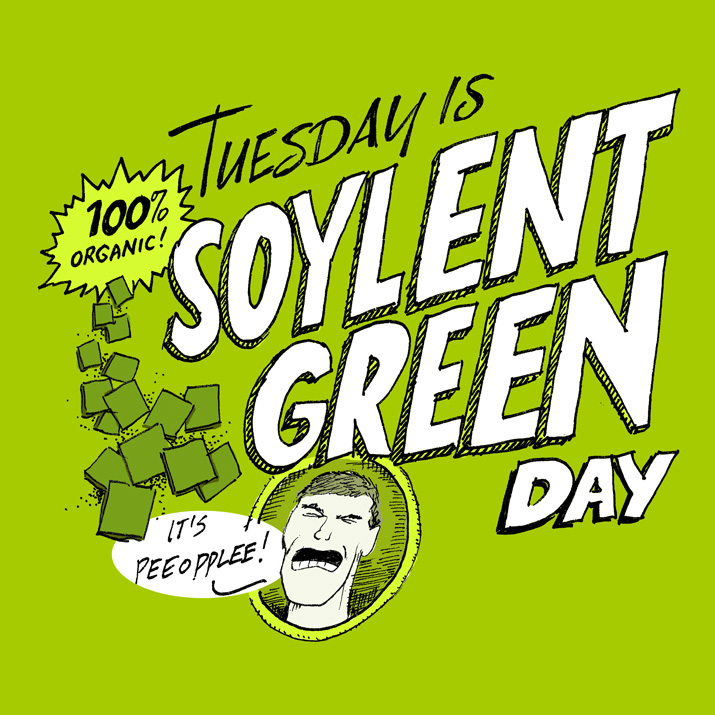 A new flavor 'Soylent Green' is introduced, made of a new 'high energy plankton' - but it's in short supply and riots are frequent. While investigating a series of mysterious murders, the main character 'Thorn' (Charlton Heston) stumbles upon the Soylent Green's main ingredient. Tools: Sharpie and Micron pens. Scanned and colored in Photoshop.